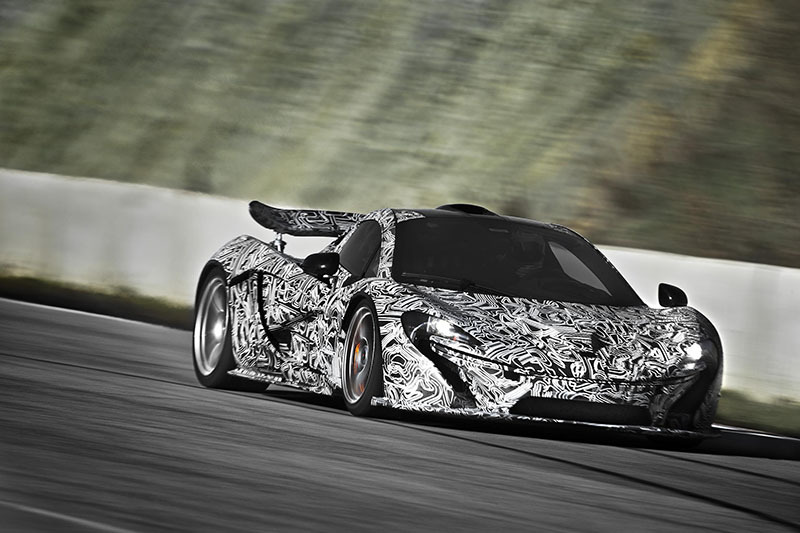 We all knew that the McLaren P1 hyper car was going to be powerful and innovative. The concept versions promised some exciting new technology that would not only help it go around a race track faster while delivering a superb driving experience, but also be responsible when it comes to the environment. With this in mind, it seemed as though things would settle in right around the 700 horsepower mark, combining both gasoline and electric motors in unison to create an adequately fast hyper car. After all, McLaren downplayed certain aspects of the car’s performance such as its top speed and proclaimed that they were trying to focus on building a complete driving package. And then they told us that the P1 is going to have 916 PS (903 bhp). Nine-hundred-and-three brake horsepower. Let that settle for a bit. Yes, we know it’s less than the Bugatti Veyron, but the Veyron is a heavyweight super-luxury hyper car that’s designed for top speed and cruising, not to be the fastest around the race track like the McLaren P1. But there’s more to that figure than the fact that it’s over the 900 horsepower mark. This power comes from a twin-turbocharged 3.8-liter V-8 engine and an innovative, highly-efficient electric motor boasting a low overall weight and advanced cooling system. 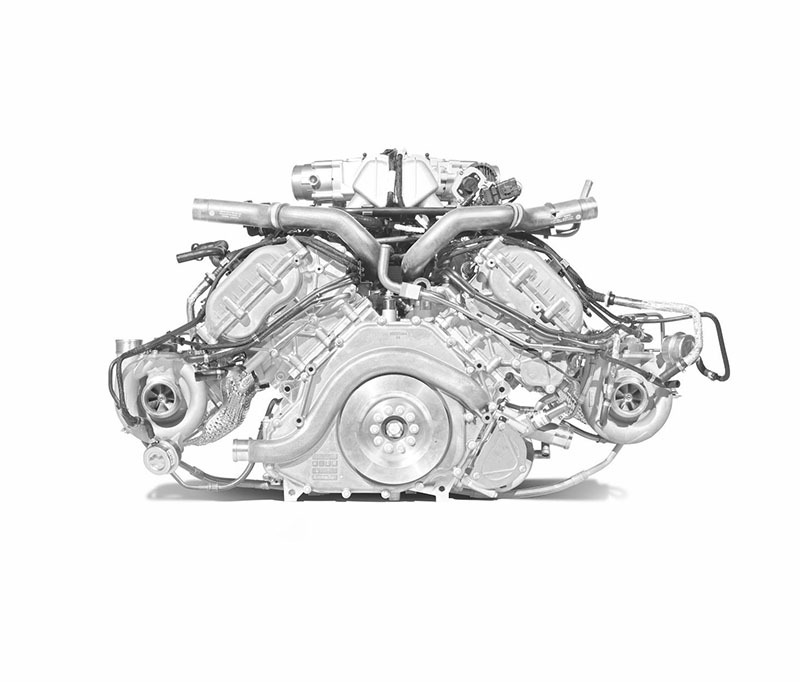 The main source of power is an impressive 3.8-liter twin-turbocharged V-8 engine that’s an upgraded and modified version of the M838T unit found in the McLaren MP4-12C. 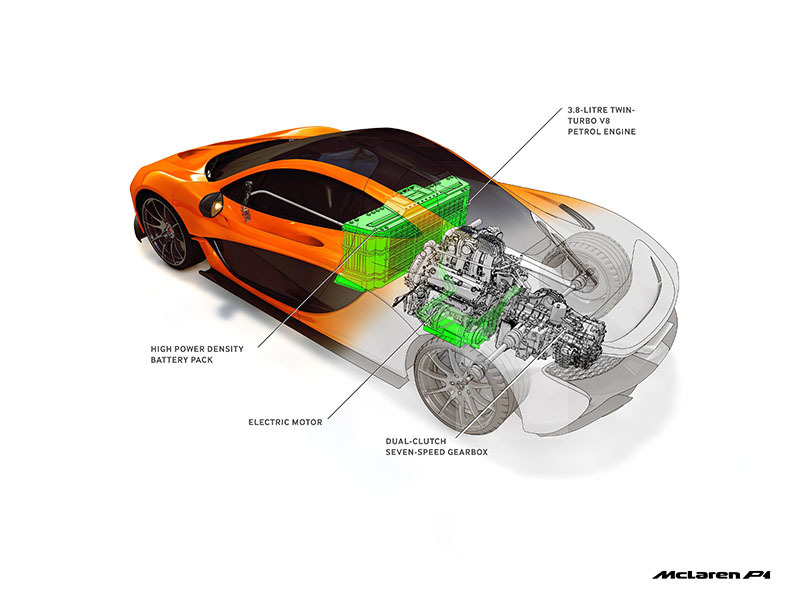 McLaren engineers redesigned aspects of the engine to improve cooling and durability during higher loads, and created a specially-designed casting that integrates the electric motor. The gasoline engine alone produces 737 PS (727 bhp) at 7,500 RPM and 531 lb-ft. of torque from 4,000 RPM, for an otherworldly 194 PS / liter output. Having 727 bhp from a twin-turbocharged V-8 would’ve been fine by today’s standards in the McLaren P1. But, the McLaren P1 isn’t designed to be the standard, it’s supposed to set standards, just like its F1 predecessor did in the 1990s. The British automaker achieved this by integrating a highly-advanced electric motor and battery pack developed by the McLaren Electronics branch of the company. The electric motor is integrated directly with the engine and is powered by a lightweight battery pack that’s positioned behind the driver and mounted to the underbody of the Formula 1-grade carbon fiber MonoCage. The entire package weighs in at just 211.64 lbs. and boasts a complex cooling system that ensures each cell is the same temperature for better reliability and performance. The system creates a total of 179 PS (176 bhp) and 192 lb-ft. of instant torque for an immediate throttle response throughout the rev-range. Both the engine and electric motor combine for a total of 916 PS (903 BHP) and 663.72 lb-ft. of torque while releasing less than 200 g/km into the atmosphere. Both the engine and electric motors are advanced and produce some insane figures, but there’s also more exciting aspects to the story. The McLaren P1 will feature a IPAS (Instant Power Assist System) that provides an instant 179 PS of power at the push of a steering wheel-mounted button for rapid acceleration. A new DRS (Drag Reduction System), similar to that found on Formula 1 race cars is employed and reduces the angle of the rear spoiler to decrease drag by 23-percent to increase top speed and automatically deactivates when the driver releases the button on the steering wheel or touches the brake pedal. The McLaren P1 will also offer a more responsible way of driving by offering an E-mode where the hyper car runs solely on the electric motor. In E-mode, the P1 has a fully-electric range of 10 km and is nearly silent while moving. When the battery is depleted, the engine automatically starts and recharges the system. Customers will also be able to recharge the battery via a plug-in charger system that can be stored in the luggage compartment or completely removed for those that want to shed weight as much as possible. The official specifications for the new McLaren P1 will be released before the official unveiling of the hyper car at the 83rd Geneva International Motor Show in March. 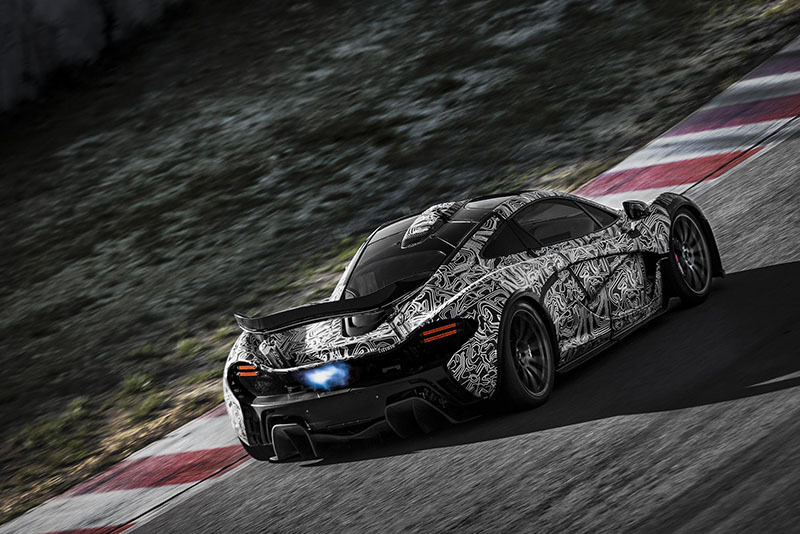 What do you think of the McLaren P1’s 903 bhp output? Leave a comment and let us know!